Image from Flickr is by Paulus Maximus! 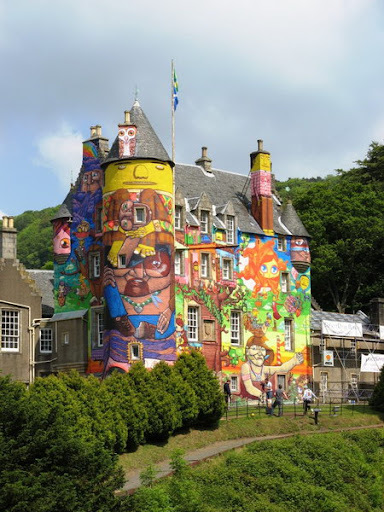 This beautifully painted castle is Kelburn Castle, near Fairlie, Scotland. 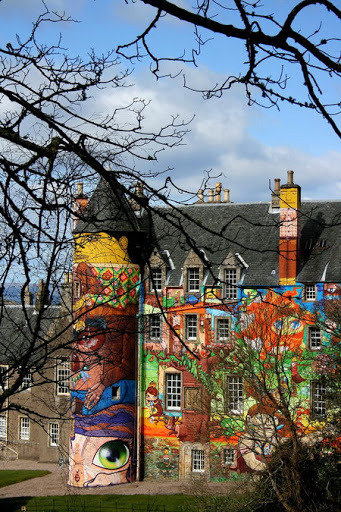 Faced with prospect of replacing the concrete of the stone walls, the owner, Earl of Glasgow, invited in May 2007, leading Brazilian graffiti artists to use his walls for their artistic ideas. The artists stayed at the castle for about a month and what is seen today is giant piece of collective art. It drew lot of Media attention and was also featured in BBC (Link). The concrete removal process is likely to start this year when all the art will be gone. Here is a video depicting the sequence of entire operation on a fast track. Credits: Special thanks to Redunzl whose this post in Google Earth Community brought this to my knowledge.